How does the neurotransmitter GABA produce myriad forms of inhibition in the central nervous system (CNS), restraining and shaping electrical activity to prevent anxiety, agitation, seizures, chronic pain and sleep disturbance? 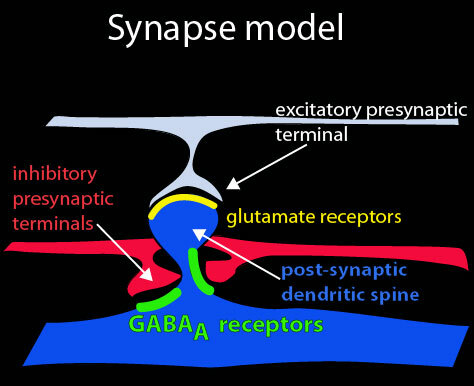 The majority of fast synaptic inhibition in the CNS is mediated by GABA type A neurotransmitter receptors (GABAARs) which are Cl- selective ligand-gated ion channels composed of 5 subunits (from up to 17 different subunits), with differential expression across brain regions, cell types and subcellular localization. The Jacob lab’s broad goal is to understand the impact of dynamically regulated GABAAR surface levels and distribution in normal development and pathological conditions. The lab uses a combination of molecular, biochemical, cell biological and live-imaging approaches. GABAAR are the sites of action of many clinically important drugs, including the benzodiazepines (BZ), which are front line treatments for anxiety, insomnia, schizophrenia and epilepsy. The Jacob lab is investigating modulation of GABAAR trafficking and synaptic inhibition by BZ and other GABAergic agents. Another area of research in the lab focuses on the role of GABAergic signaling in CNS development and plasticity. The majority of excitatory synapses in the brain are located at the end of dendritic spines, small protrusions from neuronal processes, with neighboring GABAergic synapses predominantly located on dendritic shafts. We have shown that higher GABAAR surface levels leads to more inhibitory synapses, enhanced inhibitory synaptic transmission and a deficit in mature dendritic spines. Alterations in the excitatory/inhibitory ratio of neuronal signaling, abnormal spine morphology and mutations in GABAAR subunits are associated with many neurological disorders including autism and other neurodevelopmental disorders. The Jacob lab is investigating the contribution of GABAergic inhibition to dendritic spine morphology, movement and plasticity. These studies aim to improve understanding of how GABAergic dysfunction contributes to human neurodevelopmental disorders including autism. Brady ML and TC Jacob. Synaptic localization of alpha 5 GABA(A) receptors via gephyrin interaction regulates dendritic outgrowth and spine maturation. Dev Neurobiol 75:1241-1251, 2015. Jacob TC, G Michels, L Silayeva, J Haydon, F Succol and SJ Moss. Benzodiazepine treatment induces subtype-specific changes in GABAA receptor trafficking and decreases synaptic inhibition. Proceedings of the National Academy of Sciences of the United States of America 109:18595-18600, 2012. Jacob TC, Q Wan, M Vithlani, RS Saliba, F Succol, MN Pangalos and SJ Moss. GABA(A) receptor membrane trafficking regulates spine maturity. Proceedings of the National Academy of Sciences of the United States of America 106:12500-12505, 2009. Jacob TC, SJ Moss and R Jurd. 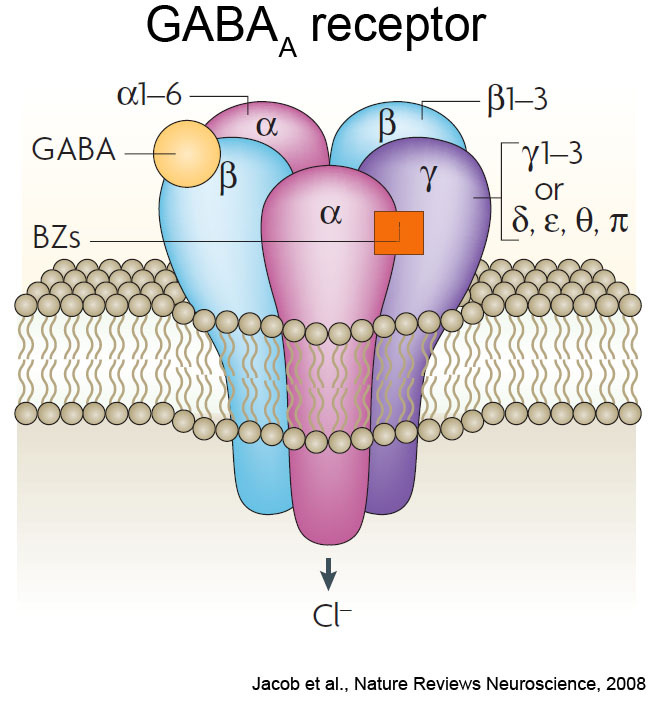 GABA(A) receptor trafficking and its role in the dynamic modulation of neuronal inhibition. Nature Reviews 9:331-343, 2008. Tretter V, TC Jacob, J Mukherjee, JM Fritschy, MN Pangalos and SJ Moss. The clustering of GABA(A) receptor subtypes at inhibitory synapses is facilitated via the direct binding of receptor alpha 2 subunits to gephyrin. J Neurosci 28:1356-1365, 2008. Saliba RS, G Michels, TC Jacob, MN Pangalos and SJ Moss. Activity-dependent ubiquitination of GABA(A) receptors regulates their accumulation at synaptic sites. J Neurosci 27:13341-13351, 2007. Jacob TC and JM Kaplan. The EGL-21 carboxypeptidase E facilitates acetylcholine release at Caenorhabditis elegans neuromuscular junctions. J Neurosci 23:2122-2130, 2003. Kass J, TC Jacob, P Kim and JM Kaplan. The EGL-3 proprotein convertase regulates mechanosensory responses of Caenorhabditis elegans. J Neurosci 21:9265-9272, 2001.